I first started off with the Deer Gold, I Heart U set. They're a nice yellow-gold shimmer with a sweater-like deer pattern repeating in contrast white (or vice versa). I found these to be a little less flexible than my previous set of Roppongi Glam decals, but worked around it. 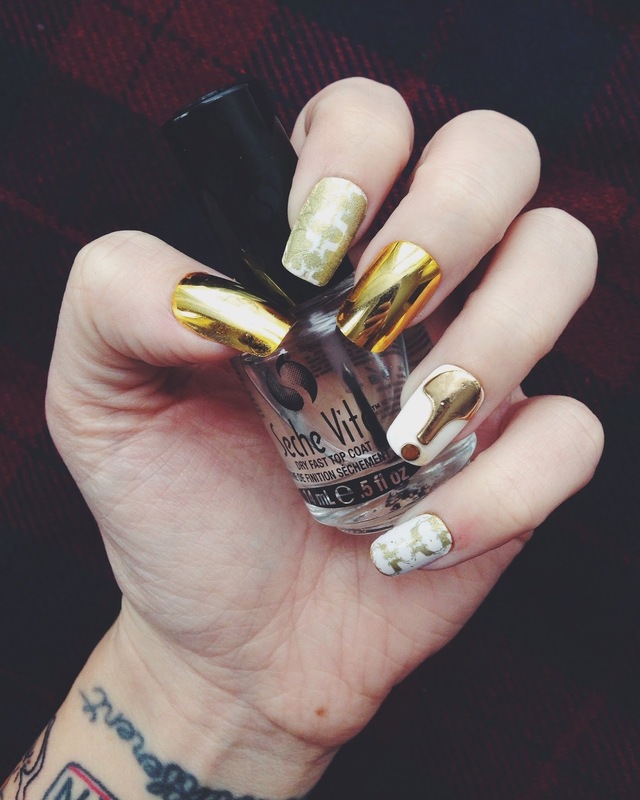 I paired them with metallic gold nails and a white polish topped with the amazing Hex Nail shield. I've posted about Hex Nail Jewelry in the past and was really excited to receive this in the box — I've been meeting to order some but dropped the ball. Scratch had my back. And this is a really awesome statement charm. It would fit better on a pinky, but I used it flipped on the index finger instead. The Deer Gold decals wore okay. The only issue I had was a tiny bit of bubbling on the sides as if they were under a lot of flex. I'm not sure if I got a bad batch or if it's the metallic finish on these. I did, however, get a ton of compliments on my manicure as a whole, so I suppose it wasn't as noticeable as I thought. Next up I used the Tartanium. Admittedly, these were done in haste. I didn't top coat these with the Seche Vite and after two days, they looked like the photo above — worn around the edges and flaking. Lesson learned. Top coat these babies or else you're going to fall apart. 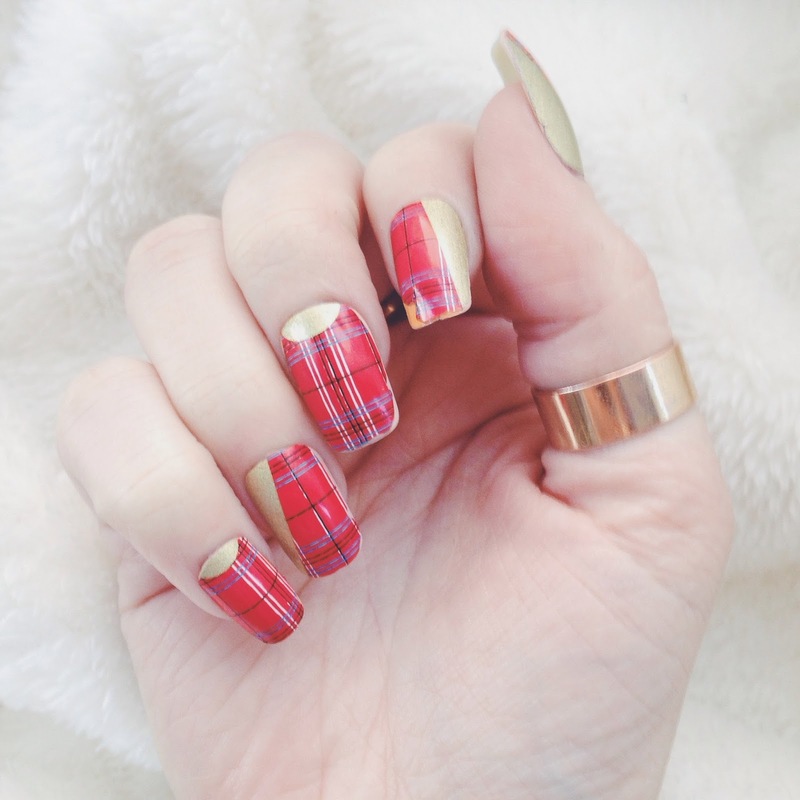 I really liked this design, but I think I was a little "over it" considering a few manis prior to this I had a DIY tartan design that I fell in love with. That is of course not Scratch's nor Emily Wagner's fault. I could see a lot of people who aren't ready to paint their own Tartan be stoked for the Tartanium nail wraps! And lastly, the Total Flake set. It has been nail crazy around this place and I haven't even had a chance to try these yet. I'll be sure to update this post when I do. What I can say so far is that I love the pattern. I'm trying to figure out a fun way to spruce these up — any suggestions? As for the rest of the box — I'm not a huge fan of peppermint. I was on the verge of giving this to Brock before I noticed that it had high fructose corn syrup. So I thought, oh well, I'll try it. Um. YUM. It's pretty rich, so I can only have a little bit at a time, but it's tasty. Sorry, Brock. As for the Seche Vite, I've written before about how much I love it. It's by far my favorite top coat. I literally just ran out last week, so this box came in at the perfect time. The black striping tape, however, is so-so. It's slightly more narrow that my other silver striping tape — something that could be either good or bad depending on the design. I'm pretty handy with painting straight lines, so we'll see how or if this stuff works out for me. ● It's a good price for what you get. Granted $30 seems steep for most of the subscription boxes I'm used to, if you consider that the MSRP of the items in this box come in around $50, it's definitely a win. ● Say you're like me and change your nails about once a week. This box will cover you for nearly the entire month — and with very little work involved. 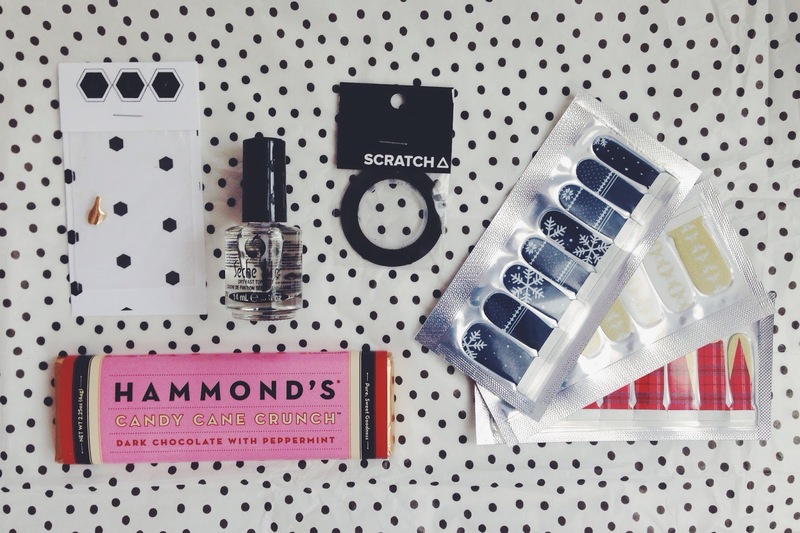 Nail decals are easy to apply and easy to remove! ● The box comes with a how-to card to help you along the way. ● Scratch has an awesome and response Twitter! Yay! ● You get to preview next month's box before it ships so that you can chose to skip it or even gift it to a friend! Nice! ● So far I haven't seen consistent quality in their strips. My first set were great, the metallic ones had a bit of a finish issue, and so on. The plaid ones were my fault, and I'm hoping the my future strips are better! ● No referral program. This isn't a huge deal, but it's certainly a perk that other subscription services offer. Overall, I'd say this is a great box for someone who wants awesome nails but doesn't want to throw in a ton of hours working on them. I already know that I'm skipping the January box, but look forward to artists collaborations for February and beyond!